Since exploding onto the Dance music scene, multitalented DJ and producer Grant Saxena has been causing chaos on the North American clubbing circuit, and has become one of the continents most in demand names. With a record collection that includes Beatport Chart hitting records such as ‘Future Truth’ and ‘Backblast’, it comes as no surprise that Grant has been racking up support from industry tastemakers across the globe and some of the world’s leading record labels – colossal achievements for any calibre of artist. Next to be added to his ever-growing back catalogue of releases and churned out of his Denver based studio is ‘Synergist EP’, a superb two-track record that certainly does not disappoint. Containing the tracks ‘Synergist’ and ‘Maximal’, ‘Synergist EP’ is full of driving, distorted basslines, epic synths, ethereal melodic breakdowns and massive drops, making it perfect for peak-hour at clubs and festivals alike – a must have inclusion in any DJ’s record box. 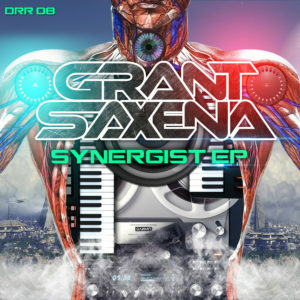 ‘Synergist EP’ is out now exclusively on Beatport via Digital Darkus Records so make sure you grab your copy quick!